North Tees and Hartlepool NHS Foundation Trust haematology/anticoagulation matron, Mercy Cabrega, has been nominated for Oncology Nurse of the Year in the British Journal of Nursing (BJN) Awards. 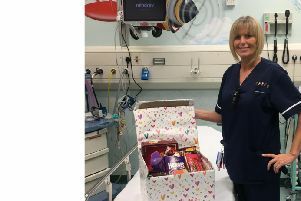 A pioneering nurse has been nominated for a prestigious award over her dedication to patients from Hartlepool and East Durham. Mercy was nominated by one of her students, who after spending two weeks on the ward, was so inspired by her commitment, hard work and positive influence she had on colleagues. During her 15 years at the trust, Mercy has revolutionised the way bone marrow biopsies are carried out, being the first nurse ever at the trust to lead the procedure. She has since trained other nursing staff to do the same, improving outcomes for patients by reducing waiting times. While on the ward, Mercy’s student was in awe of the hugely positive feedback Mercy received from all of her patients, including those who received biopsies. Mercy has also made a huge contribution to savings within the trust through an innovative approach to staffing and budgets. The awards are for those healthcare workers who make a critical contribution to healthcare across the country. The BJN Awards will take place on the March 9 at the Shakespeare’s Underglobe in London. Mercy, a nurse of 25 years, said: “Just to have been nominated for this award is overwhelming, to have been shortlisted doesn’t feel real! "I absolutely love my job, the people I work with are fantastic and the patients are always so appreciative. Julie Lane, director of nursing, quality and patient safety, said: “This is an excellent achievement for Mercy – she should be very proud!